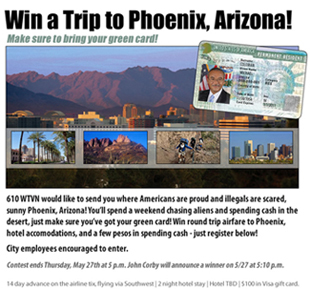 610 WTVN would like to send you where Americans are proud and illegals are scared, sunny Phoenix, Arizona! You’ll spend a weekend chasing aliens and spending cash in the desert, just make sure you’ve got your green card! Win round trip airfare to Phoenix, hotel accomodations, and a few pesos in spending cash – just register below! Needless to say, local community groups have railed on the radio station for the “chase an alien” contest. Said Leonardo Ramos, president of Colombianos in Ohio. “This is clearly the chilling effect of what is happening in Arizona with SB 1070. We believe that our community must respect and protect all people.” (You can read the full press release bashing the station here.) Members of community groups said they’ll also send letters to the general manager of Clear Channel in Columbus.